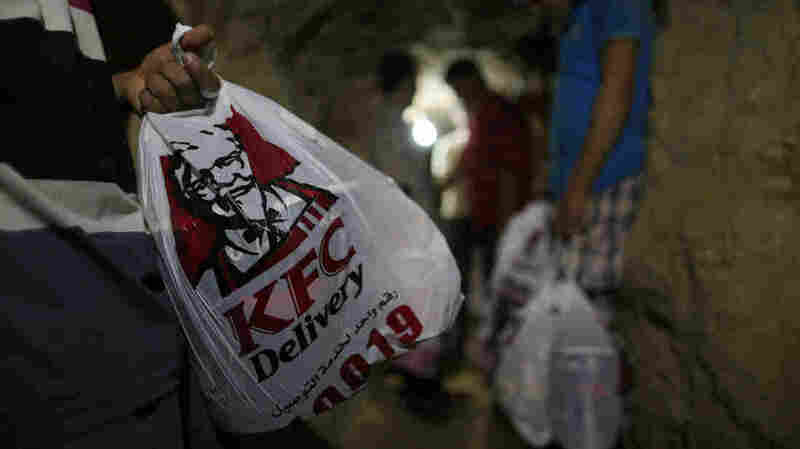 Underground Tunnels Feed Gaza's Hankering For KFC : Parallels Gaza Strip residents rely heavily on smuggling tunnels to Egypt. Among many other goods, the passageways are reportedly bringing regular deliveries of fast food. After all, with the amount of conflict that continually plagues the region, it's no wonder that such extreme measures have been taken to provide safe(r) channels through which to access supplies generally unavailable in this controversial sliver of land. According to Businessweek, these tunnels have often facilitated the flow of weapons and militants into and out of Gaza from the Egyptian North Sinai. However, reports have surfaced recently stating that these tunnels are also being used to — wait for it — smuggle lukewarm KFC into the Gaza Strip. Yes, it would appear that the regular absence of raw materials, as well as the Israeli restrictions on Gaza crossings have, among other things, made it exceedingly difficult to open an international fast food branch in the region. But now, unfulfilled-crave frustration has finally hit a tipping point, forcing Gazans to resort to not-so-fast food smuggling to get their quick fix. A crucial link in this supply and demand food chain is the Al-Yamama delivery company, which has made eating KFC in Gaza a greasy, miraculous reality. Though according to Mohammed Al-Madani, an accountant at the Al-Yamama company, the new venture was something born out of chance rather than business strategy. "We ordered and arranged to bring some meals for us and they arrive after four hours," he said. They posted a picture of Colonel Sanders' iconic chicken on their company's website, and soon thereafter, the orders started to roll in. The price of a KFC family meal is about 80 Egyptian pounds (or roughly $11) at el-Arish KFC restaurant, but getting it in Gaza costs as much as 100 Israeli Shekels due to transportation and smuggling fees ($30). As it turns out, Gazans have a fever, and the only prescription is more KFC — and they can get it, but it is going to cost 'em.